Greece holds a strange significance for Sirens of Lesbos. For starters it inspired the group’s name, a playfully anonymous moniker when they originally set out, by their own admission, to write an Ibiza hit for fun. They succeeded, the pitched down vocals of ‘Long Days, Hot Nights’ leading them onto a string of BBC Radio 1 supported hits for Exploited and Armada, garnering over 20 million listen in the process. But it was later under Athens’ ancient Acropolis, following an unsatisfactory 2015 gig there, that they realised the direction they’d set off on didn’t represent the true heart of the group. Consisting of sisters Jasmina and Nabyla Serag alongside Melvyn Buss and Arci Friede, ‘We’ll Be Fine’ is a fresh start in more ways that one. Stepping away from their club orientated productions, its lush, organic summer melodies incorporate reggae guitar licks, Eastern flutes and cosmically minded lyrics – told from the perspective of one of the group’s ex-partners – of having to leave a relationship and start anew. With BBC Radio 6’s Tom Ravenscroft already a fan, it blends the band’s love of classic analogue 60s and 70s pop and soul acts, including Moody Blues and Rotary Connection, with the modern storytelling and production of stars like Drake and Solange. More than this though, it also open up the influences of their diverse backgrounds. While all born in Switzerland, the Serag sisters’ Sudanese and Eritrean parents arrived as political refugees and freedom fighters. Arci, whose Czech parents were also political refugees following 1968’s Prague Spring, was one of the co-owners of Bern’s famous Club Bonsoir, host to everyone from Hudson Mohawke and DJ Premier to Derrick May and Todd Terje. And Melvyn, whose father is English, has been a hip-hop DJ since aged 15, subsequently working on a range of projects from collaborating with Robert Owens to providing music to the Karl Lagerfeld film. If these influences have been implicit so far, in the epic nu-disco of ‘Post-Soviet Funk’ or the wonky tribal house chants of ‘Funky Lips of Timbuktu’ (all released on Exploited), the group are intent on bringing them to the fore, while also reaching out into their various side projects such as Jasmina’s NewRa, the only Swiss act to be selected for the Red Bull Music Academy 2018. 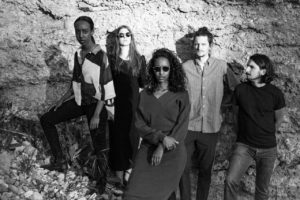 It’s already seen Gilles Peterson favourite Alma Negra picking up one of their edits of a Saho tribe song and ‘We’ll Be Fine’ is a statement of intent for what is to come. For most groups having an Ibiza hit is the ultimate goal. For Sirens of Lesbos, it was just the first step in proving the undeniable power and appeal of their multicultural, multi-faceted sound.